Can Wifi Affect Your Baby During Pregnancy Or After? We live in a world that places great value on technology and a time in which human life is being radically shaped by it. Many people spend large portions of their daily lives plugged into television screens, smart phones, tablets and computers. With the rapid evolution of mobile and wireless technology, we’ve become increasingly dependent on screens and their capabilities. A 2014 study into screen time found that adults in the US were spending an average of over seven hours each day in front of a screen. In the UK and Australia, this figure wasn’t much better with the average adult spending over six hours on screen time. It could be argued that technology is valued above many other things. How many couples do you see in restaurants staring at their phones instead of engaging in conversation? And how many parents can honestly say they don’t feel even a slightest twinge of guilt about the amount of time they spend on their smartphones when the kids are about? We’re technically more connected with more people in more places on the planet than we’ve ever been, but are we more disconnected with those closest to us. Wi-Fi is commonplace homes, schools, libraries, shopping centres, restaurants and most public places globally. Many of us now take for this granted, without giving the implications of this change in our lives real consideration. But what about the potential impacts of Wi-Fi on developing babies and children? Does Wi-Fi Affect Unborn Babies or Children? One question we should be asking ourselves, however, is how Wi-Fi could impact on our children. A 2014 study published in the Journal of Microscopy and Ultrastructure found that children are more at risk from microwave radiation. Children have more absorbent brain tissue, and thinner skulls, leaving them more susceptible to microwave radiation than adults. The microwave radiation from wireless devices is currently classed as a Class 2B potential carcinogen. Lead and the pesticide DDT are also classified as Class 2B. The time lapse between first exposure and potential tumour development can be decades, and so it is not yet known what effect the prevalence of Wi-Fi in society could be having on children’s brains. Sadly, as Wi-Fi becomes more commonplace in our society, so too do toys that make use of this technology. From children’s tablets, to computer gaming hardware, many children now own toys that rely on Wi-Fi technology. Until more is known about the safety of Wi-Fi, these toys should be carefully regulated by governments but sadly often aren’t. 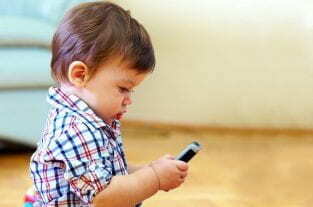 France has recently banned the use of Wi-Fi technology in nurseries and preschools that care for children aged three years and under. The law also dictates that Wi-Fi technology in elementary schools should be switched off when not in use. The researchers also found that foetuses are at an even higher risk to the effect of microwave radiation. These findings were based on a small number of animal studies performed in laboratories. The study authors concluded that pregnant women should avoid carrying their smartphones in their clothing. The study has concluded that children are more at risk of microwave radiation absorption, but it is not yet known what effect this will have. The radio signals transmitted by Wi-Fi devices are very low. Many scientists currently believe that Wi-Fi exposure is safe. One of the main criticisms of this research study is that there simply isn’t enough data available. What we know about the effect Wi-Fi can have on children’s brains remains fairly limited, and more research is needed before definite conclusions can be made. Part of the problem lies in the way Wi-Fi technology is used. Tablets are laptops should be kept at least 20cm away from the body during use, and yet many people fail to follow this recommendation. Dr Erica Mallory Blythe is a leading radiation researcher who believes parents should take steps to protect their children from potentially harmful Wi-Fi. Technology moves much faster than politics, and this could be part of the problem. Many governments are failing to update their guidelines and restrictions on Wi-Fi exposure, and at the same time Wi-Fi is becoming more common within our daily lives.